Today at work we had a celebration of Pi Day! We had 9 pies and a plate of brownies! Everything was delicious, and we had plenty of leftovers. It seemed to make our weekly department meeting a little more fun! 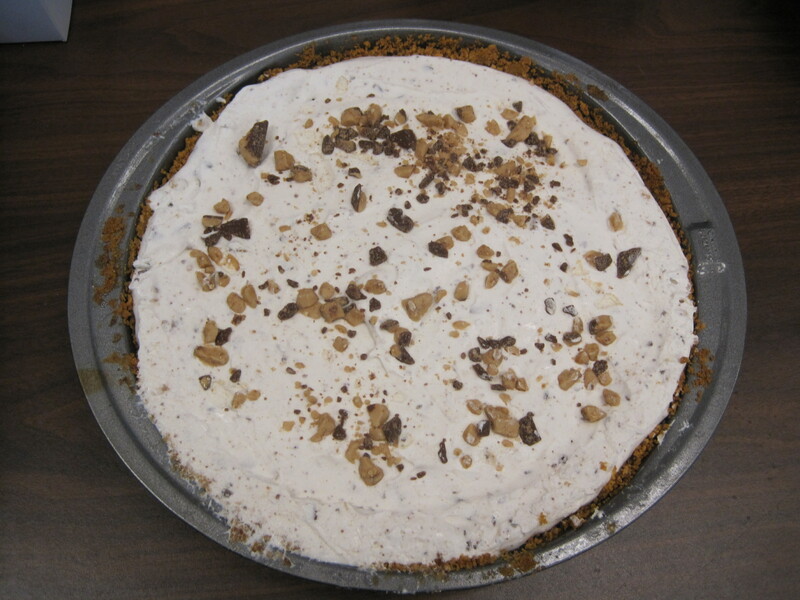 For my contribution, I made a Frosty Toffee Chip Pie. graham cracker crumbs – about 1.5 cups. Depends on how thick you want your crust. Stir together butter, graham cracker crumbs, and some toffee bits. Press mixture into pie pan. Bake at 350 degreess F for 8 minutes. In a large bowl, beat cream cheese and sugar until smooth. Beat in cream until blended. The mixture will be runny. Don’t worry, it will thicken up. Fold in whipped topping and 1 cup toffee bits. Spoon into crust; sprinkle with remaining toffee bits. Cover and freeze overnight. Remove from the freezer 10 minutes before serving. Optional: Drizzle with chocolate syrup before serving. Toffee could be substituted for a variety of candy – Snickers, Milkyway, Butterfinger, etc. Recipe modified from Taste of Home.